The district of Hongkou has a colourful history. Once part of the Japanese Concession, it became a sanctuary in World War II for 20,000 Jewish refugees fleeing Europe. The district, already home to many Russian Jews, accepted them with open arms and with no visa required. Though many of them left China after the war, their presence can still be felt in the district—in its synagogues, theatres, cafés and even newspapers. Hongkou is now the centre of Shanghai’s shipping industry. Also referred to as the North Bund, Hongkou has over 2,000 shipping and logistics companies. 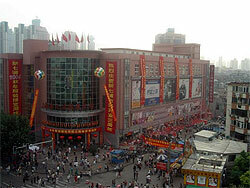 Its excellent location and hospitable atmosphere has made it the most populated pier in mainland China. Those living in the North Bund area have a wonderful view of the colonial buildings that line the Huangpu River along the Bund, as well as the modern commercial buildings in the Lujiazui area. In recent years this district, off the shore of Suzhou Creek, has developed into great housing destination, for those looking for something a little out of the ordinary. It’s also generally believed to be the cleanest district in Shanghai.